If you wanted to find food, and you are lost for ideas, where do you go ? 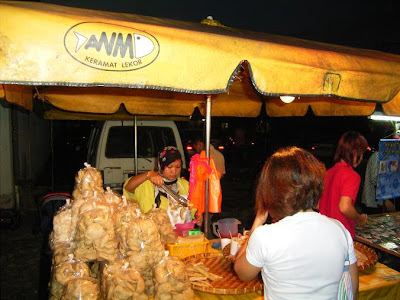 The answer is Pasar Malam lo !! It was a Sunday, we went out looking for food in Kepong. As we were making our way towards Careffour, Jusco Kepong, we stumbled upon Kepong Baru's Pasar Malam. We didn't know what we could find in this Pasar Malam..... but I was darn sure we could find something to eat. We parked our car at the old Pavillion (which is now an abandoned building) and walked to the Pasar Malam site. Since I had recently just brought back some Tarts from Raub, the first stop was to Tong Kee Confectionary. 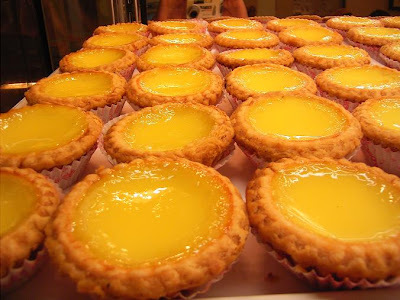 Tong Kee still does make some of the better tasting Egg Tarts, and pastries in KL. We bought one Egg Tart, and One Kaya Puff. 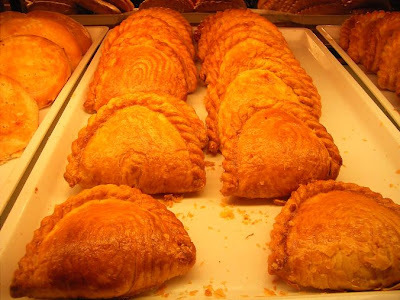 We had to compare, and we could not wait before I forget how the Raub's tarts and pastries tasted. OK, here's my 2 sen worth of opinion. Tong Kee still makes those Egg Tarts, with quality. 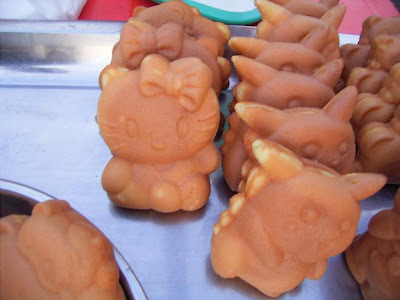 Its not like we will find out how they make em, but it does taste a little bit better than how the other bakeries make it. Tong Kee's egg tart tasted better than the Raub's one. But the Raub Kaya Puff tasted much better than Tong Kee's. 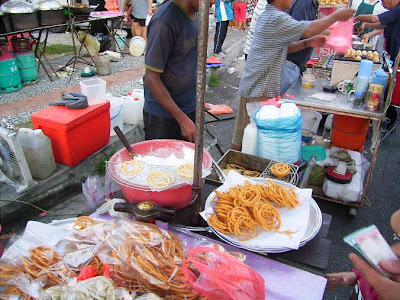 Raub's Kaya was homemade, had a better Santan Aroma to its kaya paste, as compared to Tong Kee's Kaya Puff. After we finished our pastries , we made our way around, scouting for more food. I was pleasantly surprised (haven't been to a Pasar Malam for a long long time liao), as to how much food can be found in Kepong Baru's Pasar Malam. 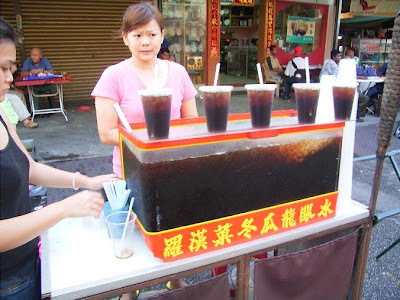 You have bubble tea on top, and a brader selling Nasi Lemak at his stall below. Apam Lipat ( I didn't know that it costs 5 for RM2.) It was bloody expensive but I am a sucker for food like this, so I had it. 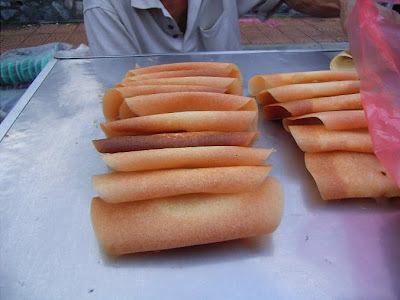 Nothing special, just tasted like Apam Lipat. 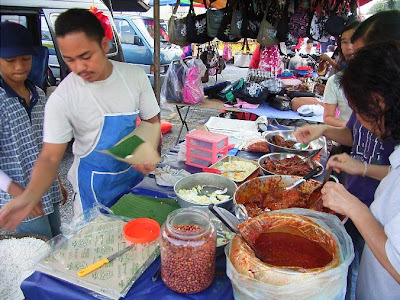 Hey look, if you ever wanted to eat FRESH, home made MURUKU, you can find a couple who makes them fresh and hot. Look !! I was really very very surprised. Wah they got Muruku. You see those bags of muruku's ? They cost RM3 each. Cheaper than the ones you find during Deepavali season that claim to be homemade. 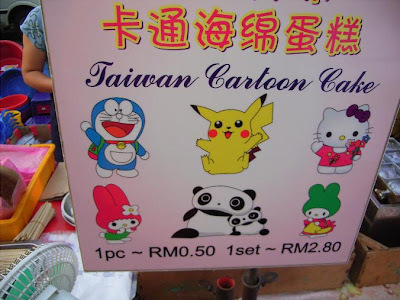 Hohoho, remember those cutesy little cartoon characters you love to hate ? And then your children won't budge from the TV no matter what you use to bribe or threaten them? Ok here's your chance to get even. You can now eat and chew them up. At only 50 sen a piece. Okay, here is my first recommendation. 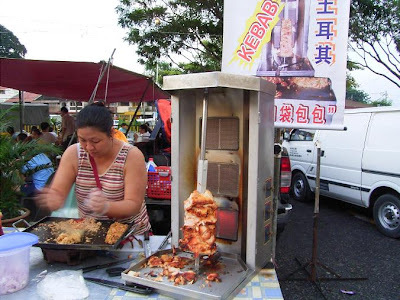 If you ever come to Kepong on a Sunday, you must drop buy this stall. It sells nothing more than just BALLS. 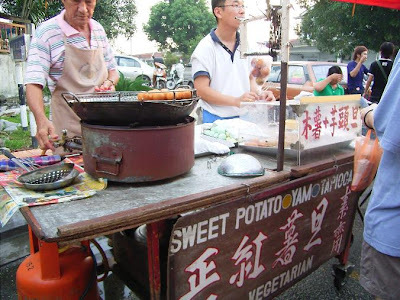 They have three varieties, Sweet Potato , Yam and Tapioca Balls. 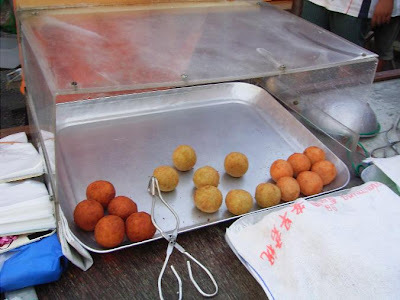 Those balls are huge, ordered one each and when this picture was taken, I was skeptical about how good they can be. Can't describe how it felt in my mouth, but I am sure they did not add sugar, yet it was sweet. Really good finger food. Not only do they make good balls , the guy actually takes good pictures too. And yeah, Kepong Pasar Malam flers can speak English nowadays. 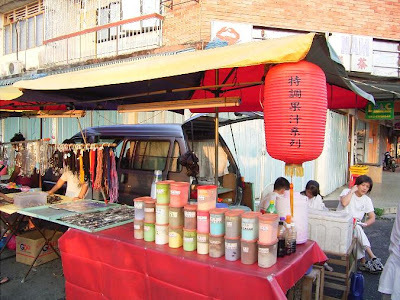 This stall is at the corner of the street, more like the edge, where Tong KEE is. Then you have lok-lok. 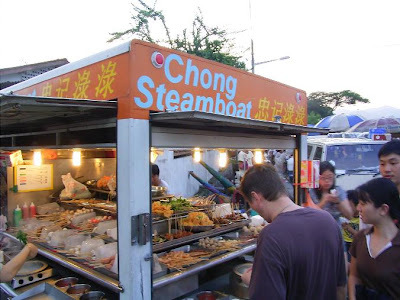 The above picture shows Ah Chong Steamboat. 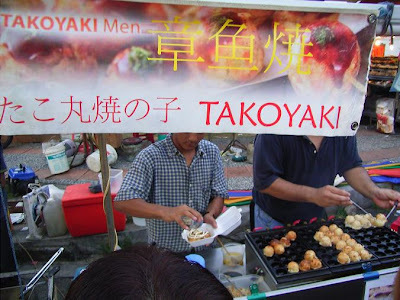 Not far away they also have Fatman Steamboat. 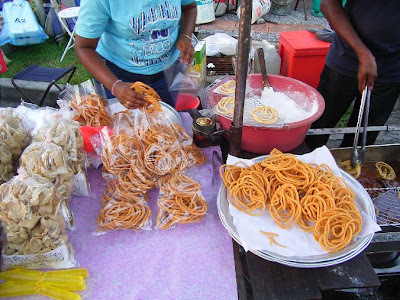 Look, they have keropok lekor in Kepong Pasar Malam too. I was hoping this Keropok Lekor, so nicely packaged, called Keramat Lekor might be something different, nope, ekkk !!! the same one, it tastes the same everywhere you go. Nothing special here. Second recommendation of the day. 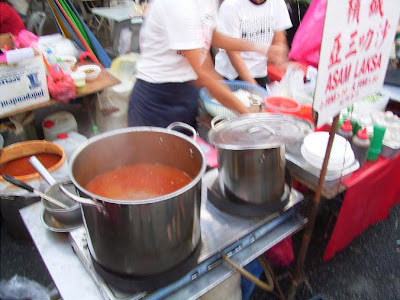 ASAM LAKSA stall in Kepong Pasar Malam. 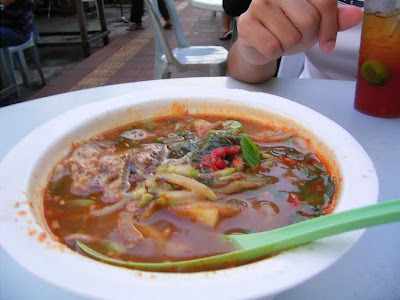 I have had some of the best asam laksas, sitting on the street, where it is dirty and without any aircond. And I was always say this, you have never been to the Pasar Malam, if you have not tried their Asam Laksa. Unless you hate Asam Laksa lo. Ok, there are two stalls here. Right opposite of each other, they sell their respective Asam Laksa. The one I tried faces the 7 Eleven. The other one I did not try have their backs facing 7 Eleven. So why this stall ? Because you can sit down at the mamak right behind their stall. So we ordered one bowl. They serve them in those Disposable OZONE Bowls. I find the soup to be quite rich in flavour, in spite of its appearance. The soup looks quite clear, not as dark in color, as compared to the ones we tried at Penang. Here's how different they are. Soup taste the same, perhaps/maybe they reduced the amount of Prawn/Fish Paste that they put into the bowl. The fish comes in chunks, as compared to their Pg Asam Laksa version which has their fish shredded all over. I think they are bold, they serve Asam Laksa their way , not Penang Style. Oh ya they don't claim to be Penang Asam Laksa, this stall is just ASAM LAKSA. My recommendation for this stall. I also tried this Kebab stall. Unfortunately, they serve only chicken kebabs. The lady cuts her chicken into little chunks, and later recook them. She adds chili sauce, lettuce, and onions. A little mayo before she puts the serving into a pita bread, and wrapped in wax paper. I looked at it, and it looked soggy, mayo + chili sauce. Sayang took the first bite. The expression was priceless. First bite was followed by the dilation of her pupils, she looked at me, then she looked at the Kebab as, if she couldn't believe it was that good. She( I meant the kebab lady) was smart, the chicken kebab was minced into smaller pieces on her grill and it had thoroughly mixed together with the salad, onions, chili sauce and mayo (brilliant!!!) . Not the best looking food , but it did taste good. 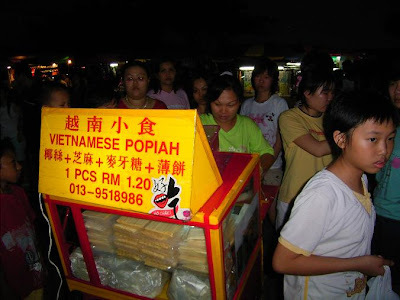 But then of course, later we stumbled upon an interesting stall that sells Vietnamese Popiah. By that time we were already too full to try anything else. So we passed on the popiahs.